There are the schools you like and then – unless you went there – there's Duke. If you don't like the Blue Devils, here's how you interpret Christian Laettner's iconic game-winning shot against Kentucky in the 1992 East Regional: it never should have happened. Prior to "The Shot", there was "The Stomp" – when Laettner plodded onto Kentucky’s Aminu Timberlake. (Laettner, in all his snarky glory, refers to this as a “love tap” in the aptly titled ESPN documentary “I Hate Christian Laettner”). He should have been ejected from the game for it. Sure, we don’t know what would have ultimately happened if he had been, but we do know one thing: he would not have made that shot. If hatred directly correlated to winning, then everyone would despise UCLA. The Bruins have won the most championships in college basketball – 11, or seven more than Duke has. But UCLA doesn’t experience widespread disdain and it’s not just because baby bears seem cute and cuddly. The problem with Duke is that they always seem to get an unfair advantage. The perception of the Duke players and fans have further contributed to it. My friend Gabe – who like a true Kentucky fan points out that “The Shot” also resulted from a foul by Duke that went uncalled – notes that at UK, much of the anti-Blue Devil vitriol stems from the feeling that the Duke athletic teams and the vocal majority of their fan base were, in his words, “somewhat arrogant, a bit entitled, and often undeservingly privileged.” Which, of course, is also a sentiment that extends far beyond Lexington. Stats show he’s right. In the 22 seasons since Laettner graduated in 1992, Duke has indeed won two more national championships. But they’ve also been eliminated from the tournament before the Elite Eight on 15 occasions, including eight times before the Sweet Sixteen. This year, Duke has defied past history and Kelli’s bracket, which also had them out by the Sweet Sixteen. Her Duke hate was spurred by a past marriage – her ex-husband despises the Blue Devils for a number of reasons, including “The Stomp” and their perceived unfair advantage. (“European soccer players are even astounded by the shear amount and egregiousness of Duke's flopping,” he quipped. “And the refs still give them virtually every call”.) Because of this, she always has them losing early, “even if they are the overall No. 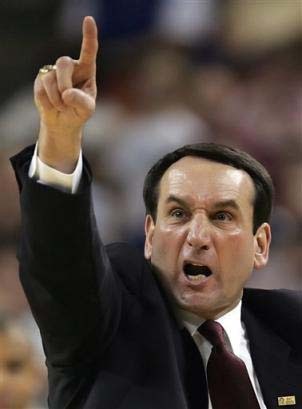 1 seed.” While marriages may end, Duke hate endures. Maybe that’s because because change is hard. Koma said she has had a “hard spot in my heart for Duke since the days of Christian Laettner”, and though she always admired Bobby Hurley's hustle, Grant Hill's quiet mastery of the game, and respected the heck out of Coach K, she just can't cheer for them. She compared Duke to Vegemite, which, in case you didn’t know, is – and I’m quoting here – a “black paste made from leftover brewers’ yeast extract and has a salty and bitter taste that lingers in the mouth”. Some people really dig Vegemite; it’s apparently big in Australia. American kids, however, reacted with disgust to it. The puke jokes practically write themselves. But what if Vegemite started to taste more like, say, Nutella, that chocolate and hazelnut spread everyone seems to love? In small ways, that’s happening with the Duke basketball team. They’re obviously talented, but they’re more versatile than usual; they don’t seem to over-rely on three-point shooting in the same way they once did. That’s largely due to Jahlil Okafor, who is rather difficult to hate, as much for his post prowess as how unassuming he comes off despite his dominance. He also epitomizes how Duke has changed: He’s all but certain to leave school after one season, which used to be anathema in Durham. In the Laettner days of the early ‘90s, “the cornerstone of the Blue Devils program was its reliance on four-year players”. Elton Brand represented the first crack in the dam but it took until 2010 for the floodgates to open in earnest. Since then, all of Kyrie Irving, Austin Rivers, and Jabari Parker left after one season, a club that Okafor and fellow freshmen Justice Winslow and Tyus Jones may join as well. Which raises questions about the scope of this hate. If players don’t stay at Duke long enough to hate, will people ultimately look at the program differently? Or, on the flip side, does a good and likeable player need to stay long enough to change the perception of a program that has been ingrained over the course of more than 20 years? Will their wins ever be considered fully fair and earned by a legion of haters? Only time will tell, since it does supposedly heal all wounds and end all things. Then again, no one ever said anything about Christian Laettner. The Dukes do get some advantage, unfairly in every game they are losing and it's a fact. I have to go to best dissertation writing service now and get them working on my thesis.